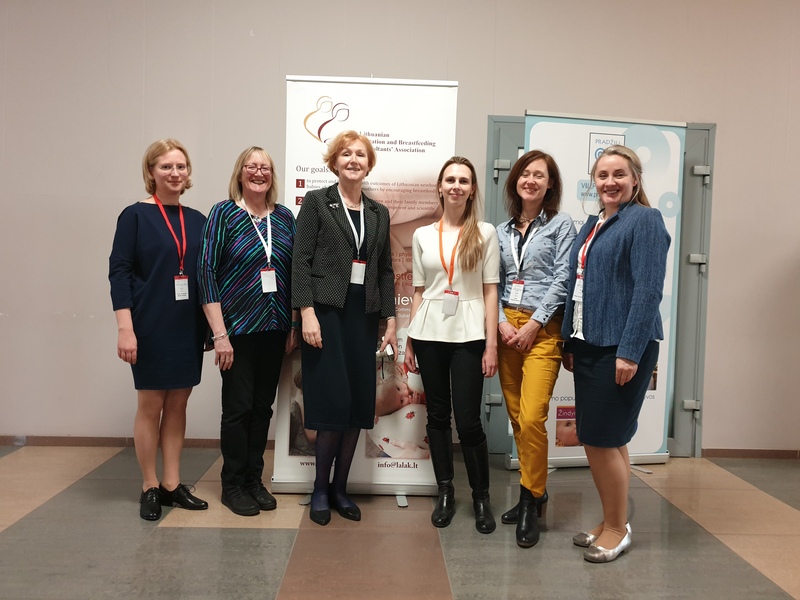 Last week I had the privilege of visiting Lithuania as a guest of the Lithuanian Lactation and Breastfeeding Consultant Association for their Annual Study Day. I was lucky to have two days in Vilnius before the Conference on Friday. I was looked after by the President Daiva, who some of you will have met at ALCI Annual Conference in Maynooth last year, and Asta, another of the Committee who had previously spent 6 years in Dallas with her family. To have two such excellent translators at my disposal was a total gift as we were able to go over my presentation and fine tune the translation to fit. It is interesting in the Lithuanian language that a full sentence often represents a single word in English e.g. there is no word for ‘siblings’ and so it translates into ‘other brothers and sisters who have the same parents’. The flights to Vilnius arrive late Tuesday night and it was a welcome sight to see a friendly face holding a sign that read “Sue J”! Asta dropped me to my room – just off the main street in the Old Town, a delightful warren of streets selling the three things Lithuania is famous for – amber, wooden toys and linen. English is widely spoken and the city is geared for tourists. It is easy to walk around and to find your way from galleries, to museums, coffee shops and of course the amber sellers. Public transport is cheap – €1 for a bus journey anywhere, including back to the airport. I spent the first day doing a walk about with Daiva and her gorgeous wheaten terrier Dohreh. Dogs were allowed into just about everywhere and often a dish was provided for her too. As Daiva needed to prepare her presentation for Friday ( I was relieved to see that last minute-ism happens here too! ), I spent the evening preparing my presentation –not for Lithuania, but on GDPR for Cuidiú in-service training for Breastfeeding Counsellors on the Sunday when I arrived back! Never a dull moment – not even when it’s GDPR! On Thursday I spent the day sight seeing and in the evening after work Asta collected me and we went to visit the fairytale castle of Trakai, set on an island in a large area of lakes and wetlands about 25km from the city. It was magic to walk around it and see the sun setting over the lakes. We sampled the local foods of the Karaim people who make up one of the many nationalities represented in Trakai. Small wooden homes exist today as they would have since earliest times and the local foods are all cooked fresh to order. My choice was Kibinai – traditional pasties filled with mutton and onion. Just like a Cornish pasty. A notable feature of Trakai is that the town was built and preserved by people of different nationalities. Historically, communities of Karaims, Tatars, Lithuanians, Russians, Jews and Poles lived here. The majority now are Lithuanian and Polish with some Russians and a handful of Karaim families, who run the local restaurants. Practical aspects of anatomy and physiology and lactation outcomes – this presentation was relayed via Skype from a Lithuanian colleague based in Geneva and we had live Q & A following the presentation. Differential diagnosis of jaundice and identification of normal Vs abnormal situations with jaundice. An interesting over view of this was presented by the Neonatologist Dr Dalia Stoniene and it over ran significantly! The next speaker was due to be me but due to the time over run I offered my slot to dental specialist Dr Laura Linkeviciene. She gave us a super presentation on feeding the baby with Cleft Lip or Palate or both. They have produced a lovely book of which I have a copy (in Lithuanian) to help parents talk about this subject and prepare for surgery. They also make use of palatal obdurators to encourage feeding at the breast wherever possible and using all the tips and tricks we already have at our disposal. My presentation – which was seamlessly translated slide by slide while spoke in English. Most of the audience could follow the English as long as I didn’t go too far ‘off piste’ and over stress my poor translators too much! I can’t thank them enough for their faithful rendition of my talk. It was well received and I had a number of questions after the presentation. We broke half way and had a three minute refresher break where we all danced to Shakira’s Waka Waka – this time for Africa. It certainly go us livened up! After the lunch break there were three rotating workshops covering (i) Assessing position and attachment (ii) Assessing a breastfeed for good milk transfer (iii) Relaction if breastfeeding has been interrupted . These sessions were presented by a mix of community based IBCLC’s and medical/hospital based IBCLC’s. I sat in on them all and while there was no translation, the hands on demos were very familiar to me as was the identification of poor suckling from Youtube clips of actual mothers. The idea was that each group would identify and suggest remedies for the various presented problems. Really good hands on learning and sharing of information. Not surprising at all was that the community-based doulas and other volunteers scored the best in all three hands on situations because they see many more babies past the early days. So what was the most significant take away from my day – one very interesting statistic; when hospital stays were reduced to 48 hours instead of four days, their breastfeeding rates began to fall. They attribute falling rates in Lithuania to this one practice. They too value community-based support and feel that they don’t offer sufficient follow up to the early discharge dyad. Food for thought indeed. So, as my flight home was not till Saturday at 11pm, I found myself with another day to complete my tourist experience in Vilnius. No visit to Vilnius is complete without a stroll through Uzipus. The self-proclaimed “Republic” of Užupis” is Vilnius’ Bohemian and artistic district. It has its own anthem, constitution, president, bishop, two churches, the Bernadine Cemetery – one of the oldest in the city -, seven bridges, and its own guardian called The Bronze Angel of Užupis, who was put in the centre of the district in 2002. Currently, there is a large mirror mosaic egg at the foot of the statue – Easter is only around the corner. My final stop was to the Cat Café where a dozen assorted ‘rescue’ felines present themselves to be stroked and cosseted while you have coffee and cake. Divine for those who love cats! Good food, easy access around this beautiful Capital City of Vilnius would make it a definite short break stay for anyone who loves exploring old cities and their heritage. Thank you to the LL&BCA for hosting me and showing odd their beautiful city. I’ll be back!